Overseas Motors of Mercedes-Benz is a premium Mercedes-Benz auto dealership in Windsor, ON. They offer stylish new and used Mercedes-Benz cars. Josh Boismier is Business Manager of the Windsor Mercedes-Benz dealership. Products Carried: Overseas Motors of Mercedes-Benz offers classic and stylish new and pre-owned Mercedes-Benz cars in Windsor, Ontario. The Mercedes-Benz dealer also offers car leasing and financing options, auto repair service, tires, and parts and accessories. 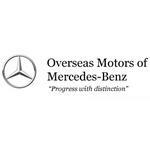 Overseas Motors of Mercedes-Benz serves Windsor, Sarnia, Chatham, Essex, and the surrounding areas.